Compact cameras have been bugging me recently. These days, most of them are reasonably well laid out, with effective controls and a variety of features (some more useful than others), which is all very well until you actually take a photo, and then the plot can get lost. Too many modern compacts offer image quality that ranges from okay to lacklustre and occasionally even dire, especially in low light – the result of cramming too many pixels on a tiny sensor. When you use a crowbar to get twelve million pixels (or more) onto something smaller than your fingernail, you get image noise. Then you have to run noise reduction processing to try and eliminate some of the noise, and this softens the images. I’ve seen some horribly flaccid images lately, on cameras from companies that should know better. No one is likely to notice or care as long as they only view and send images online or print 4×6 copies, but woe betide anyone who tries to print their shot of a lifetime at A4 or A3, only to find it’s as soft as a sponge cake. This is the world that camera manufacturers foisted on us with the megapixel wars. 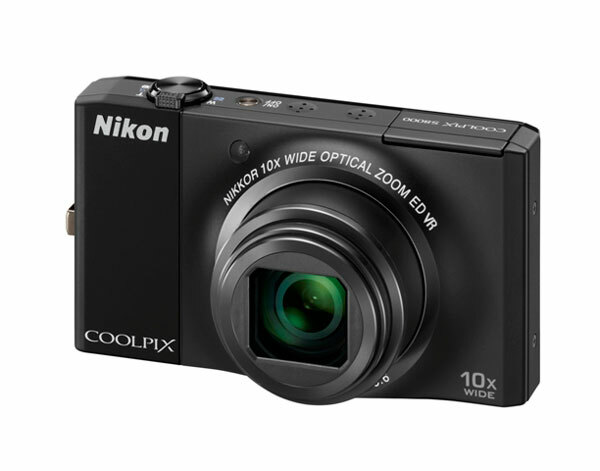 Which brings us to Nikon’s Coolpix S8000 and its 14.2 MP sensor. A recipe for disaster? A bad dream? We’ll get to the sensor and image quality shortly, but first more about the camera. The S8000 is a small (103 x 57 x 27.3 mm – W x H x D) and nicely built point and shoot compact with zero manual functionality; for everyone like me who wants to drive their cameras themselves, there’s a multitude who just want to point their camera and push a button. The specs sheet covers a 10x optical zoom lens with stabilisation, 720P HD movie capture with stereo microphones, a 3” 921,000 dot LCD and a 1cm macro shooting mode. There are 16 scene modes to choose from. At 30-300mm, the “wide” lens isn’t all that wide, which is surprising considering many competitors are offering 24 and 25mm wide angles. I’d rather have 25-250mm than 30-300mm. Start up is virtually instantaneous, or at least the screen fires up in milliseconds. There’s an irritating three second delay before the camera is actually ready to shoot or to zoom the lens. A lot of fiddling revealed that if you place the camera in scene mode and just mash the shutter button regardless after start up, the S8000 will shoot almost immediately and the shot will be in focus. You can only shoot at the wide end like this but at least you can get a shot off in a hurry. The S8000 obviously has the ability to shoot almost as soon as it starts – firmware upgrade please! The autofocus system however, is as fast as any compact I’ve used. As long as it’s not trying to focus on an area with minimal contrast, the S8000 locks on with real vigour. Pingback: What’s With The Compact Camera?